Endodontists are different than regular dentists in that they specialize in endodontic therapy, or procedures that focus on maintaining the health and wellness of the soft inner tissue of teeth (known as pulp). Most dentists will focus on endodontics to some extent, but some teeth require more specialized treatment. This is when a dentist might refer you to an endodontic specialist. An Endodontic Specialist Is Different Than a Dentist! All endodontists are dentists but not all dentists are endodontists. Less than three percent of dentists have gone on to receive the additional two years of training it requires to become an endodontic specialist. The additional training specifically focuses on diagnosing tooth pain and root canal treatment. The goal of an endodontist is to ultimately try to save a diseased tooth. When the need for a root canal treatment arises, an endodontist is guaranteed to diagnose and treat even the most difficult cases. Root canal treatment in Staten Island begins with anesthetic. Then, a rubber dam is placed around the diseased tooth to isolate it from the others. The inflammation is then treated. 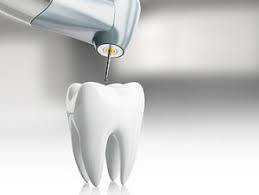 Endodontic Treatment is usually done in one visit, but may take two or three depending on your particular case. Endodontics also involve treating oral pain such as cracked or fractured teeth. Cracked teeth may manifest themselves in other symptoms such as oral pain, headaches, neck aches, or ear pain. An endodontist is specialized in recognizing and diagnosing tooth infection and using specialized treatments to ease this pain. After inflammation of the pulp is removed through a root canal treatment or healed through therapy, the pain will go away. An endodontist will work hard to ease the pain and save the tooth through root canal treatment. Endodontics involves specialized technology to better treat the pulp of the tooth comfortably and successfully. Rubber dams are used to isolate the tooth and keep it dry. 3D imaging with digital radiographs allows endodontists to take very detailed pictures of diseased teeth in order to see and treat the tooth infection. Because a root canal is so small, endodontists use specialized microscopes to see inside the canal to thoroughly treat the problem. In rare cases, retreatment may be needed as the treatment fails or the pain returns months or years later. Luckily, the diseased tooth can often be saved through a second root canal treatment. If a tooth that has previously been treated worsens or becomes painful, seek the opinion of a qualified endodontist in Staten Island.